This article first appeared in the Rushville Republican on November 15, 2016. We all have the capacity to give. Money, time, talents, and influence can make differences in people’s lives. National Philanthropy Day is Nov. 15, 2016. One local young lady’s generosity is making a difference to children in this community and surrounding communities. Prior to the Rush County Fair hog show, Kassie Herbert spoke to Brian Ripberger asking him if she could donate her hog premium to the Jake McKee Heart of Gold Fund. As Jake’s cousin, this fund was very special to Kassie and she wanted to do something to help the fund grow. During the auction, Brian spoke to the attendees about Jake’s fund and what the plans would be for the fund to offer free pediatric cardiac screening once the fund was established and sustainable. The original bid for Kassie’s pig was $850. After the auctioneer sold the pig for $850, additional community members began to donate money towards the fund. The final total when Kassie walked out of the ring was $5,550. With the donations received that evening at the Rush County Fair hog show, the fund would be deemed established because this money would bring the total to over $10,000. Due to the large amount of money and the numerous donations, Annette Niehoff from Wells Fargo offered to collect the money and then turn the money over to the Rush Memorial Hospital Foundation. When Kassie learned that Wells Fargo was collecting the money, she took a step further and asked Wells Fargo to match the money that she collected. Wells Fargo Representative Annette Niehoff spoke to her boss (Brent Yohey) and found out the steps that needed to be taken to pursue this request. With the help of Kassie’s mom, Michelle, they sat down and wrote a grant to Wells Fargo requesting match money. Due to the timing of the request and the amount of money Wells Fargo had available, they weren’t able to match the money, but Wells Fargo was able to donate $1,000 to the Jake McKee Heart of Gold Fund. 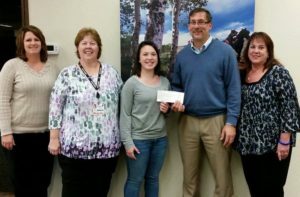 Recently, after all of the pledged money had been received, Wells Fargo Store Manager, Brent Yohey, and representative Annette Niehoff presented the check to Kassie Herbert who then presented the check to Rush Memorial Hospital Foundation Director Faith Mock and Niki McKee, Jake’s mom, for the Jake McKee Heart of Gold Fund. This is an amazing example of community and support that has been and continues to be overwhelming and graciously appreciated. Celebrate National Philanthropy Day and give a tax deductible monetary donation of any size to the RMH Foundation. You have three ways to make a donation: 1) Mail a check (made payable to the RMH Foundation), at 1300 North Main Street, PO Box 215, Rushville, IN 46173, 2) donate online at www.rushmemorial.com/foundation, or 3) stop by the RMH Foundation Office at 1230 North main Street and personally drop off your gift. Feel free to contact the RMH Foundation at 765-932-7568 with any inquiries and thank you for your support.